As I sat at yet another “procedures and paperwork” meeting (aka the training that administrators force you to attend on an all too often basis), I sighed. I am painfully aware that IEPs need to be written to be measurable and precise, but I struggle conceptually and sometimes ethically with this concept. Unlike learning 26 letters in the alphabet or being able to add numbers to ten, language learning is rich, deep, and not especially linear. In addition, language is learned, practiced, and reinforced not just in structured academic settings, but throughout one’s life. I know that a child’s vocabulary is low compared to his same-age peers, but how do I write a measurable goal to address that? Do I determine that Sam should learn 100 new words this year? 200? 300? And even if I could determine a number, how can I accurately measure his progress when I see him for sixty minutes per week? If you read through the articles, you may come to the conclusion: Although we have strong evidence to support interventions in typically-developing students., there is limited research-based evidence to support language interventions in children with delayed language skills. Researchers *think* that imitation, modeling, evoked production and direct instruction will lead to improvement in students with SLI. The federal government has stated that IEP goals must be data-driven. We cannot write goals such as “Mary will improve her language skills by using correct grammar in a conversation.” That goal is not measurable, specific, and frankly, how would you even know where to begin? Instead, we must strive to write goals that are concrete and measurable. For example, I may write that “Given a list of 10 verbs, Johnny will correctly use irregular past tense forms in sentences in 8 out of 10 opportunities in the next 12 months.” That is a measurable goal. I can show progress on a pretty little graph. I can make parents and administrators happy. Happy them = happy me. Use informal assessments or lists of target words to determine present levels. Mini Language Club is a product that I created for pre-testing syntax and semantics skills, practicing, and then post-testing to measure progress. This might be a great place to start. You can also come up with your own lists of words based on classroom curriculum, expected words for age-level, or CCSS. After calculating percentage correct on the informal assessment, decide on the area(s) that are best “next steps” for your student. I recommend working on areas where the student is currently 20-40% accurate. Choose goals that are within the child’s zone of proximal development. It is important to choose no more than 3 goals. Although I realize that most of our students could work on thirty goals, we do not have the time or energy to work on all of these goals and progress monitor for each of them. There is nothing worse than writing progress reports only to realize that you do not have data for ½ of the goals that you have written. Explain that in English there is a great trick for telling someone that something already happened, it’s called “past tense”. For many words, all you have to do is add “ed”. For kids with some literacy skills, I like to write this out for them. Model using 10 targeted regular past tense words with an overemphasis on the ending. Have the child repeat each of the 10 words. Model sentences with regular past tense. Have the student repeat the sentences. One of my favorite parts of being a speech pathologist is doing fun and engaging activities. Use the targeted words and goal areas within crafts, games, etc. Mini Language Club is extremely helpful for focusing on the targeted words and goal while having fun on a craft or game activity. Plus, it can be sent home for extra home practice. Anyone who has worked with mixed groups knows that only working on each student’s specific goals is a nearly impossible task. The truth of the matter is that students need to practice MANY language skills. Take time to focus on vocabulary, critical thinking, social language, predicting, etc. through book units, crafts, and activities for mixed groups. Every few weeks or months, go back and reassess your student’s skills on their goal areas. Because I do many of my therapy sessions by month or season, I tend to use the same targets for 3 months, reassess, then determine new targets that work on the same goal. You can use a data sheet such as the one in Mini Language Club or create your own. It is most valid to use the same target words as you previously used to measure progress over time. Determine if the student has made progress and what changes need to be made in the next few months. Is it time to increase the number of targeted words, or change the instruction? Voila! 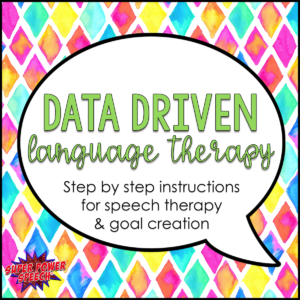 Data-driven language therapy that is manageable for even the busiest of SLPs! I love how you have taken the concerning conclusions you, me, and many others may draw from the EBP brief on language intervention for kids with SLI and created a very clear plan to support students based on the information we do have on language intervention in general. Kudos to you! Awwww! Thanks Shani! I try. Hopefully this doctorate program will help me learn to take the evidence and apply it more to practice.